Win a Tour of the Murray's Cheese Caves! The kind folks at Murray's Cheese are offering CurdNerds readers the chance to win two tickets to one of their new cave tours. I wrote about the tours yesterday on Serious Eats, and they were also covered in a little snippet in today's New York Times. The tours are offered on the third Saturday of every month, and this contest is for the tour that will happen on February 16th at 3:15pm. For details on entering the contest, keep reading. 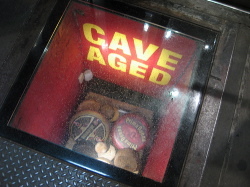 The Prize: Two tickets to a cave tour on February 16th, 3:15pm, at Murray's Cheese in New York's Greenwich Village. The Deadline: All entries must be received by February 9th, 11:59 EST. How to Enter: Submit a comment in this blog entry below with your best suggestion on what topic(s) or question(s) you would most like to see covered here on CurdNerds.com. We will pore through your submissions and select the best one! The winner will be notified by email, so be sure to register before you post your comment. If you don't register we won't have any way of contacting you! Our complete contest rules are available here.